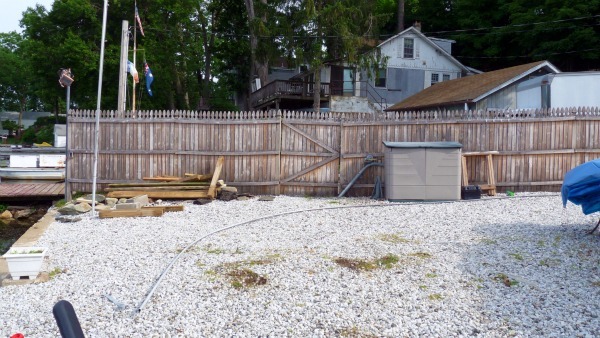 Since summer is here and we’ve been working diligently in our yard I thought it was high time to stop take a look around and see where our yard is today, where it was and where it’s going. 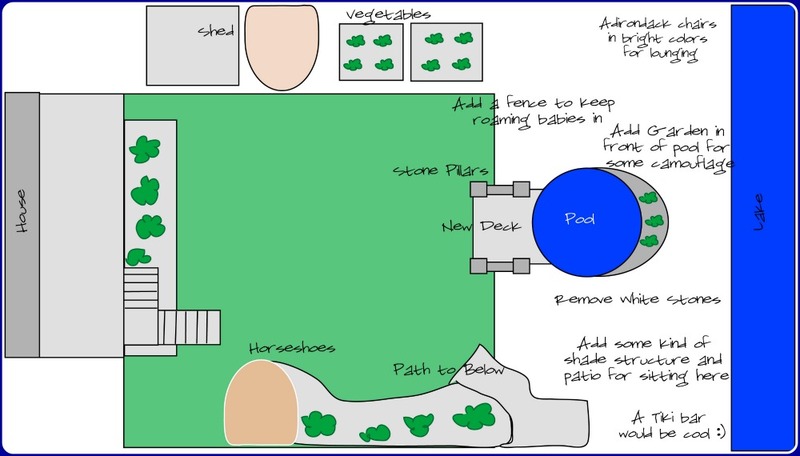 I updated this cute little (not to scale) drawing of our backyard that represents some notes of where we’re thinking we are heading with our yard overhaul. Here’s an overhead view of how the yard looked when we first bought the house on the day of our home inspection. We had so many ideas from the day we laid eyes on this view. Here’s an in-progress shot from the same angle as it looks today. It’s been a little bit of a construction zone over the past couple weeks, we’re working towards making it a really inviting retreat after a hard day at the office. It’s super sunny and aitch-oh-tee-tee. HOTT down there when the temperature rises above 60 degrees. I’m not kidding, you could fry an egg on the stones on a hot summer day. 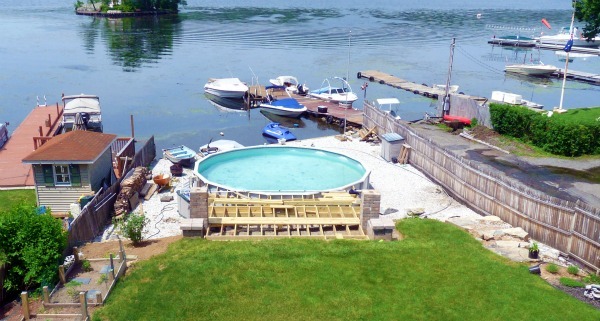 We’re updating the pool deck platform to make it a cool inviting area. One where you can relax, get your toes wet and watch the kids floating the days away in the pool. We’re thinking that will probably include some sort of shady, relaxing, lounge area. 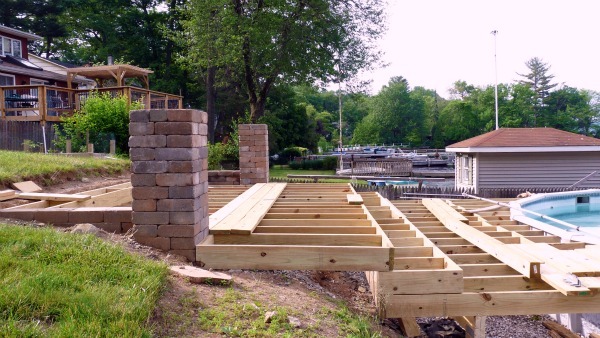 The deck platform will have a couple of steps to gradually transition from the lawn level to the pool level, and a fence and gate to keep curious little children safe and sound. 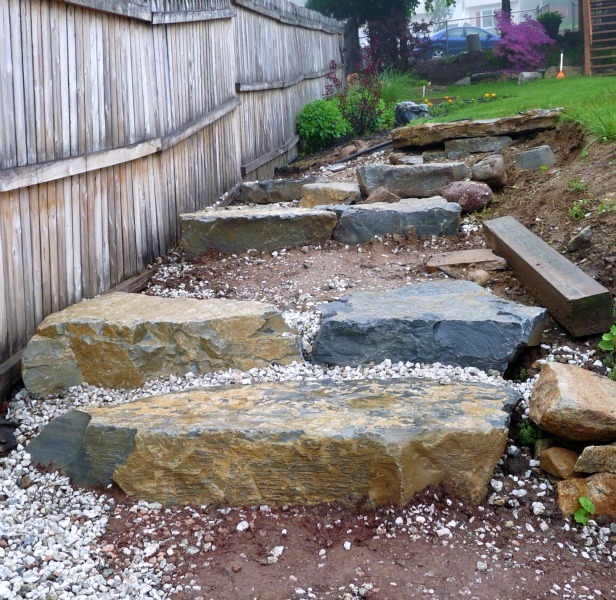 The path to below is currently being updated to include some natural stone steps (you can read all about how this surprise project started here). As you head down the stone steps you can see that you just can’t get away from all that white stone that we inherited, in small doses those stone may be attractive but it doesn’t exactly lend itself to kids playing barefoot in the sprinklers the way it is now. As you come down to the water’s edge we think this is an ideal spot for a small patio and an area to sit and relax, some shade maybe in the form of shade sails or a pergola and if we get really spunky an outdoor bar would be totally cool after all this is the money spot right here. And then is this corner we’re thinking some really fun (think sherbert colored with a punch) Adirondack chairs would be lovely instead of the extra row boats (which are soon to be on Craigslist) that we somehow acquired. 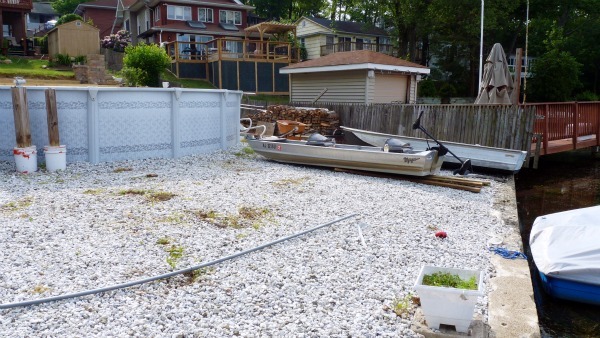 We’ll also add a garden in front of the pool side that faces the lake with some flowing ornamental grasses that rustle in the breeze contrasted by rose bushes, camouflaging the less than stellar above ground pool look we’ve got going on. And if you didn’t get enough of the before shots here’s a little video of the space as narrated by a 14 month old boy! Needless to say we’ve been thinking about this for a little while and have come up with a preliminary collection of things we like. The kind of things that are likely to change at least 1,000 times before we’re totally finished but for us part of the fun is in the journey, although the finish line is looking really good right now! 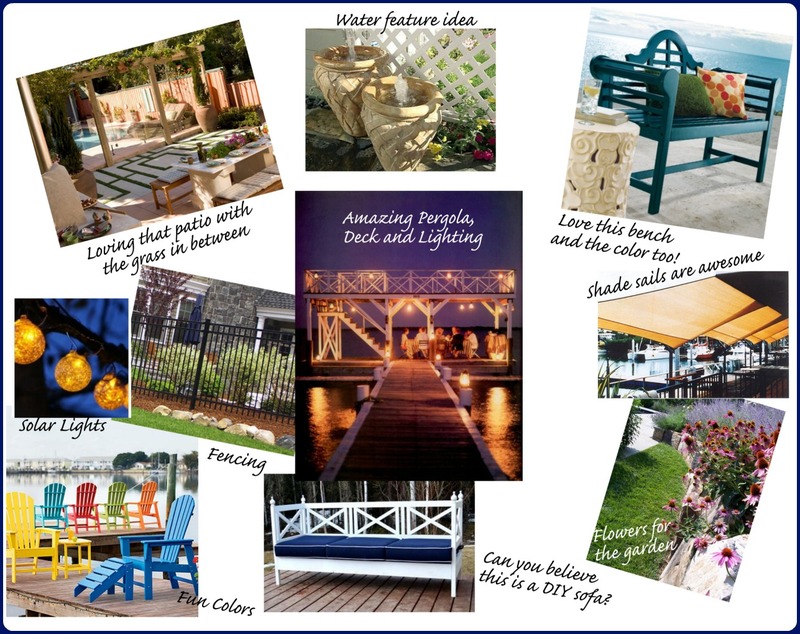 Psst: If you like any of the items in our inspiration board hop on over to our Our Lake Life’s Lakeside Inspiration Pinterest Board for all the details and sources along with tons more. In addition to the sponsor section, Our Lake Life sometimes contains affiliate links. What this means is that if you make a purchase from one of these links Our Lake Life may receive a commission on the sale of the product. All of the content I share here is what I genuinely like and is not influenced by any other manner. 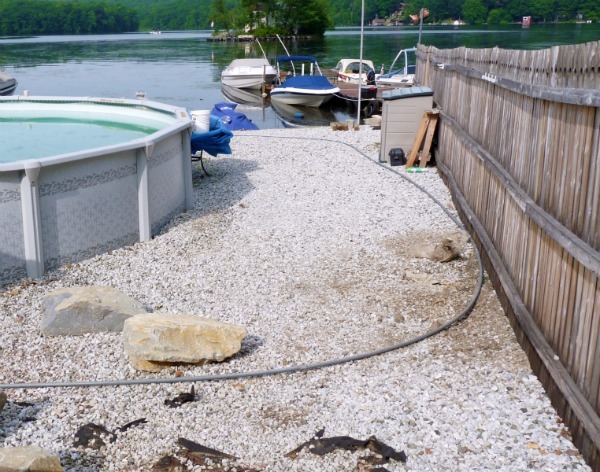 By purchasing through Our Lake Life you are supporting the time it takes to bring you great ideas and products. « « Previous Post: Bright Bold & Beautiful!